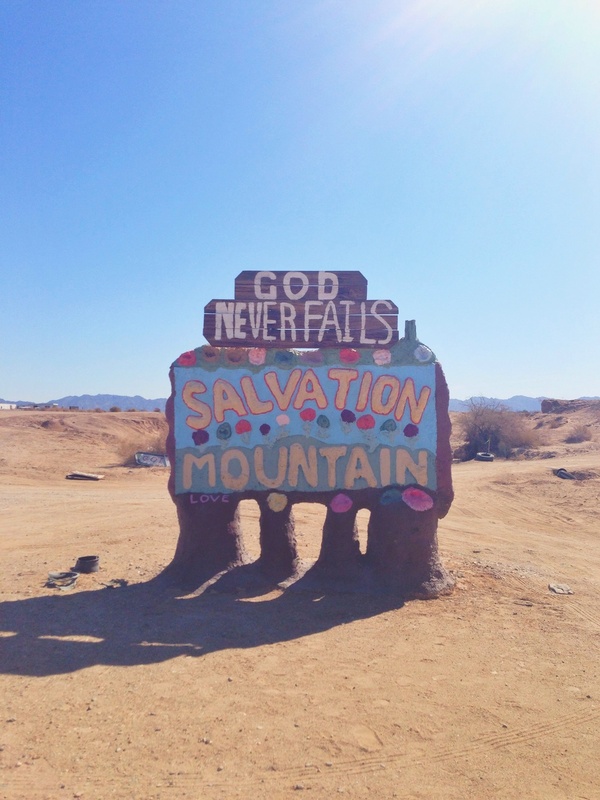 On our last visit to California, I'd really hoped to visit Salvation Mountain at Slab City in Niland. Our plans changed a little bit and we didn't have the time, so it was definitely on the cards for this visit. Salvation Mountain is a giant art installation, created by Leonard Knight over almost 30 years. An installation to symbolize God's love, the mountain is completely covered in scriptures and biblical phrases. It took 2 hours to drive from Palm Springs to Slab City, and we detoured for a look at the Salton Sea - a salty, toxic sea that doesn't even have sand on it's shores, just fish bones and shells! It was beautiful to look at from afar, but any closer and I think we might have had a different story. It's a fairly isolated part of California, very small towns and very minimal developments. Just a very long straight road for miles and miles, with turn offs to different ranches and Date Farms along the way. Eventually reaching Niland, a small town that had seen better days. Lots of evangelical churches (4 or 5 on one short street) and run down homes. The next strip was full of trailer parks and permanent trailers set in random places. One set up even had a Nazi flag waving proudly in the wind - we were totally horrified that something like that could be celebrated so openly, and it seemed even weirder being next door to a First Baptist church. We eventually reached Slab City, with Salvation Mountain rising out of the ground in all it's colourful glory! It was early in the day and I think we were the only ones on the site, although a caretaker lives onsite in a nearby trailer. A woman was riding past on her bike and invited us to an open mic night at the community, so it seems as though the locals were quite friendly. The mountain itself was quite impressive, built from Adobe clay and hay, colourfully painted with pictures patterns and phrases. There were alcoves and sculptures built into the installation, meaning you could walk all the way through the pieces as well as climb the mountain. I had thought a site proclaiming such love would feel peaceful and cheerful, but something about the isolation and scale of the work made it feel a little bit eery. We weren't there for very long (desert sun is serious business, even at 9am!) but it was definitely an interesting visit and we're really glad we made the effort to drive out and see it!